A fresh video compilation of an ALMA transporter in action is now available. Under construction on the Chajnantor Plateau in the Chilean Andes, ALMA (the Atacama Large Millimeter/submillimeter Array) is a revolutionary observatory, designed to study some of the coldest and most distant objects in the Universe. When construction is completed in 2013, ALMA will have a total of 66 antennas, which can be repositioned to reconfigure the telescope. The antennas, which are constructed from state-of-the-art precision components, each weigh over 100 tonnes, so moving them around requires specially designed vehicles. These vehicles, named Otto and Lore, are 20 metres long, 10 metres wide, 6 metres high, and have 28 tyres. 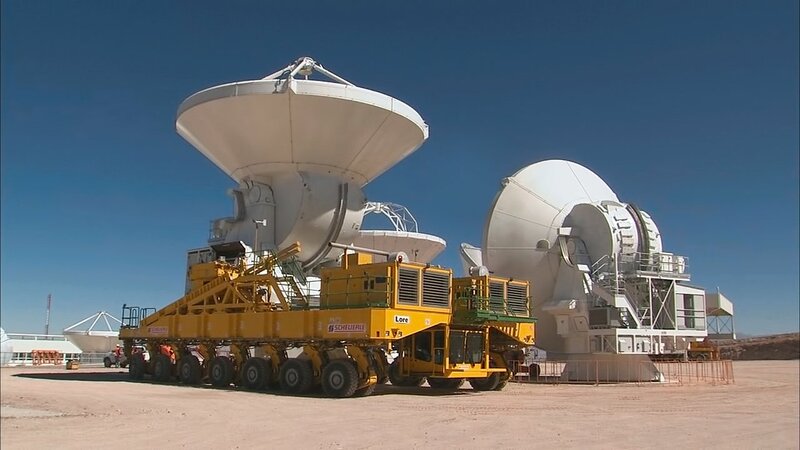 An overview of the whole process of moving one of the 12-metre ALMA antennas, using the transporter Lore, is shown in this compilation. In this case, the move took place at the observatory’s Operations Support Facility, at an altitude of 2900 metres in the foothills of the Chilean Andes, but the transporters are also used to move antennas to, from, and around the Array Operations Site, at an elevation of 5000 metres on the Chajnantor Plateau. The complex operation begins with an early morning meeting of all the engineers and technicians involved, followed by a safety check of the transporter. The driver then manoeuvres the giant 28-wheel vehicle towards the antenna, using a remote control while standing outside the vehicle’s cabin, in order to be able to check the positioning as carefully as possible. The antenna is disconnected from its base, grasped by the transporter, and slowly raised into position on the transporter’s chassis. The transporter then carefully moves the antenna to the new location and deposits it gently in place. The 14-minute compilation of footage is a summary of a process which can last several hours. ALMA is an international astronomy facility, supported by Europe, North America and East Asia in cooperation with the Republic of Chile. ESO is the European partner in ALMA.